What’s the best part about this time of year? For us, it’s a delicious holiday meal, enjoyed with family and friends. Wonderful food, great conversation, more food, relaxation. Well, relaxation for almost everyone. Not so relaxing for the home chef whose hard work makes the great meal take place: Creating a menu. Compiling recipes. Shopping for ingredients. Preparation. Hours of cooking. Collapsing in exhaustion while everyone eats. 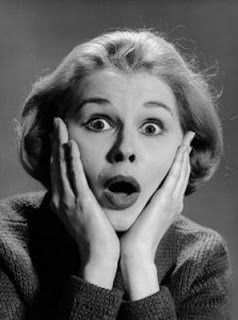 And the worst travesty of all: Not enough time to watch football. Being a big fan of both great food and not working too hard, we were wondering if it is possible to use that 21st century concept of outsourcing to allow everyone to enjoy a relaxing holiday meal… even the home chef. A discussion about this very topic with a friend revealed two opinions: He was sure that no “take out” meal could compare to homemade, and I opined that a professional chef working in a commercial kitchen could prepare a meal that was easily superior to what even an advanced home chef could create. Always up to a challenge, our friends at Hubbell & Hudson generously offered to send over one of their popular holiday dinners to see how it measured up to homemade. 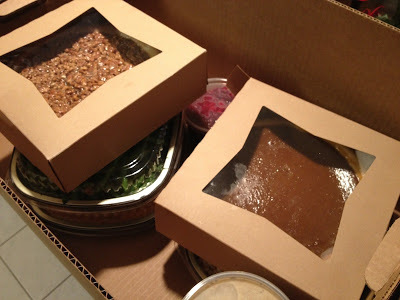 Since we’re willing to make sacrifices and research this tasty quandry for our readers, we took ’em up on their offer and received two well-packed boxes filled with ready-to-heat components of a complete holiday meal for a big family. We opened the boxes, and found all of the courses expertly packed and in perfect condition. We followed the dead simple heating instructions (also available on the website if you misplace the included paper… don’t ask me how I know this.) Once we were done, we spread them out and invited the assembled omnivores to dig in. First to be attacked were the side dishes. A container of whipped sweet potatoes was pure in its simplicity – we detected nothing other than sweet potatoes in the dish. I think this is a wise choice; you can complement it with caramel syrup and marshmallows if you want something extremely sweet, or with a simple bit of butter and nutmeg if you want something more savory. Next up were the green beans. The fresh, lightly cooked beans were topped with sliced almonds and gently seasoned, and the result was light and refreshing. Our teenagers, not normally drawn to vegetables, made sure that we had no leftovers. 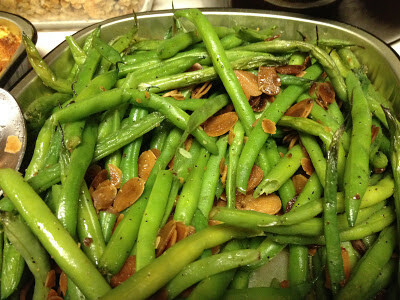 Green Beans that appealed to our teenagers. Remarkable. No turkey dinner is complete without dressing, and here we found the only misstep. Hubbell & Hudson used sweet cornbread in its dressing, and we felt that the sweetness of the bread was slightly overpowering. A more neutral cornbread recipe would have resulted in a dish skewed more toward the savory, and that would have made us happier. The centerpiece of the meal was the whole roasted turkey. A free-range, naturally brined Howard Kaufman Farms turkey is roasted in-house at Hubbel & Hudson after receiving a savory, herbal house rub. The result is a delightfully juicy bird that has a rich, savory flavor throughout. 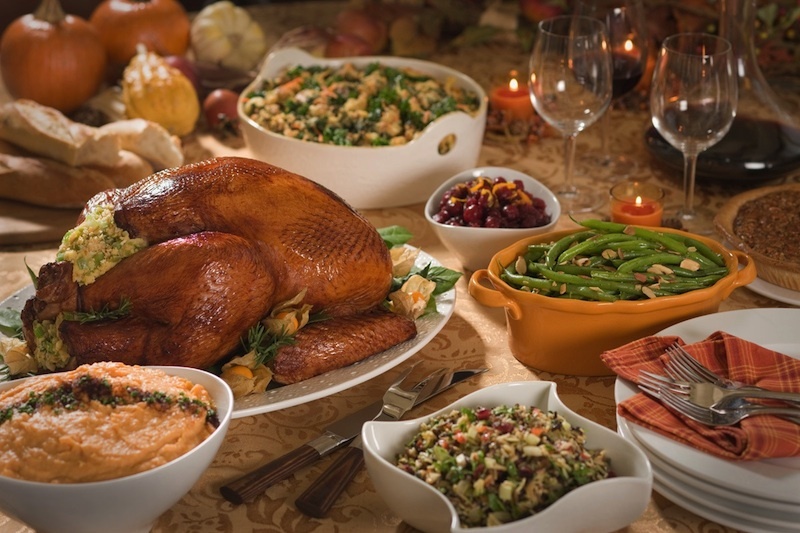 Dark meat was deliciously flavorful, and the white breast meat (often dry when you buy a turkey and prepare it at home) was moist, subtly herbal, and in short, delicious. We can’t eat turkey without cranberry sauce, and Hubbell’s was remarkable. Whole cranberries are seasoned with plenty of rosemary and a hint of orange, and the sauce was actually more of a relish – one that was fruity, complex, and utterly captivating. We wouldn’t hesitate to spread this on a cracker and enjoy it even without the turkey. For dessert, two pies were included. First up is the classic Texas Pecan Pie. After sampling this pie, no one can call Hubbell & Hudson stingy with the pecans; the pie was chock full of huge pecan pieces, with only a tiny bit of the sweet syrupy binder that holds the pecans together. 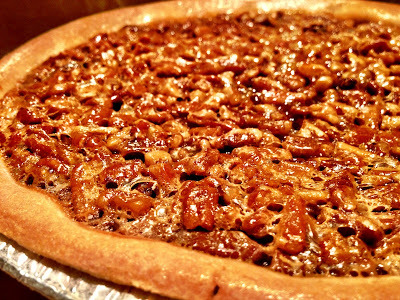 The result is a pie rich in the flavor of roasted pecans, and not overpoweringly sweet. Next is the Hubbell & Hudson pumpkin pie. This rich, dense pie isn’t your mother’s pumpkin pie – the fresh pumpkin flavor is complemented by the complexity of significant spicy tones, most promiently ginger. Picking up a slice I was surprised by its weight – I can’t ever remember seeing a more lush pumpkin pie. Trying to fight off the impending coma caused by consuming this epic meal, I have to conclude that my original opinion was confirmed: The pros at Hubbell & Hudson could create something that I could never hope to duplicate on my own. It’s going to be tough next year to hunt down all the ingredients, slave away over the hot stove for hours, and end up with a result that doesn’t measure up to this meal. Hello its really looking delicious food. What the best time to visit this place. My family catered thanksgiving from H&H this year too and were very happy with our meal. The turkey was the star of the show. Best turkey I've had hands down. We also added the pumpkin soup and pumpkin cheesecake and both were divine. Our whole family would agree with you about the dressing… While it was good, we are used to a much more savory dressing and would have preferred it to not be made with the sweet cornbread. But overall fantastic meal! I love all the documentation and images you’ve done for the food. I like the extreme Pecsan Pie that was awesome.